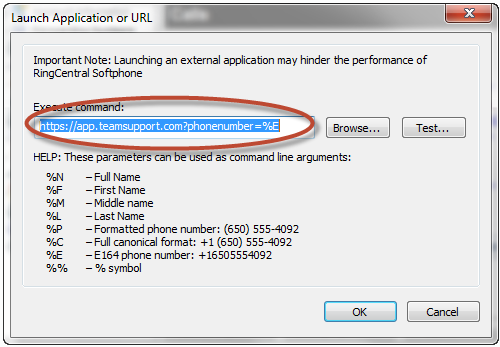 TeamSupport offers two ways to integrate with the RingCentral phone system. Is you are using the RingCentral softphone application, you can have it launch TeamSupport automatically and bring up information on the client who is calling you. With the softphone application running, go to the upper left and click the menu button, then select “Options”. 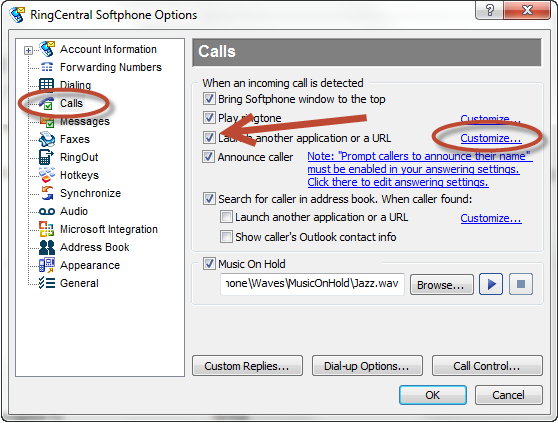 In the options menu, select “Calls” on the left, then check the box for “Launch another application or URL” and then click the Customize button. When this setup is complete, whenever your extension rings, TeamSupport will automatically open and we will try to locate a Customer record which matches the phone number from the caller ID. If someone calls your support line and leaves a voicemail, you can set up RingCentral to forward that message to an email address. Simply set the forwarding address to the email which forwards into TeamSupport and a new ticket will be created which will have the audio of the voicemail as an attachment. You can get creative with these by setting up a Ticket Automation to notify people or route a voicemail differently than other tickets, or you could use an alternate email address to treat these tickets in a different manner than a normal email ticket that comes into the system.